On the night of October 7, 2006, I'd headed out late, bound for the Manhattan Classic Car Club. Dashing south from the NYC suburbs in my loyal Toyota MR2 Spyder, joyously freezing with the top down, I cursed the sudden brake lights that signaled a command-presence of Westchester County police. Twenty minutes later, I exited at Canal Street in Lower Manhattan, and arced onto Hudson, just feet from the Holland Tunnel to New Jersey. 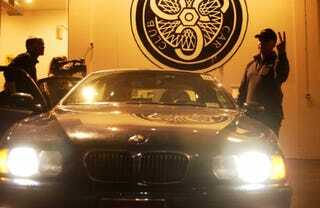 The glare of video lights shown through the club's open garage door, highlighting the outline of a familiar BMW. I'd made it on time by just minutes, keeping my promise to Alex Roy by a toothskin. My obligation to act as an impartial witness to his latest of several attempts to break the coast-to-coast speed record was fulfilled. So why did I have misgivings? Roy's memoir, The Driver: My Dangerous Pursuit of Speed and Truth in the Outlaw Racing World, will hit bookstores this week, serving dual purposes. For one, its narrative proffers the backstory to Team Polizei, the Teutonic-themed guise Roy derived for the Gumball rally in 2003. Perhaps more important, at least for automotive information junkies, is the formal declaration it'll issue. And this is it: Roy and co-driver Dave Maher last year raced from New York City to Santa Monica Pier - a total of 2,795 miles across 13 states — in a 2000 BMW M5, arriving after 31 hours, 4 minutes on the road. If accepted by the community of rally cohorts who scrutinize such matters, that time will best all other such records of lore, the most recent clocked this past May, when rivals Richard Rawlings and Dennis Collins claimed a time of 31 hours, 59 minutes from New York City to Redondo Beach, California in a black Ferrari 550. It also dramatically undercuts the celebrated record of 32 hours, 7 minutes set by David Diem and Doug Turner, winners of the 1983 US Express. To some, confirming such an act will always involve a leap of faith; no third-party auditor will certify that which involves breaking the law - something Roy and Maher did hundreds of times along the way. Statutes of limitation having expired, Roy's documentation of proof - the toll and gas receipts, the GPS markers, the time-coded videotape and the accounts from witnesses - can now be disbursed. Insiders will argue over minutiae (for example, the legitimacy of his chosen start and end points). Simultaneously will be an inevitable media tour, bound to stir up several news cycles' worth of real or feigned indignation among commentators and interviewers. And let's be real; it's easy for some to get apoplectic about Roy's chosen avocation, considering the highly illegal rates of speed it entails on public roads, not to mention the road-rally company Roy's kept during the past decade, a story told across several chapters in "The Driver." I'd always considered modern road rallies like Gumball and Bullrun — with their whistle-stop partying and multimillions in automotive exotica — to signify the worst sort of new-century decadence; the kind of flaunting, decline-of-western-civilization happenings that feed the tabloids and stir talk-radio curmudgeons into a lather of self-righteousness. These motoring orgies seemed to mock Brock Yates's original coast-to-coast concept, born from discontent with overly harsh speed limits. Screw these new rich, oblivious assholes, I thought, with their Ferraris and Koenigseggs and Saleen S7s, and the high-mileage groupies who rode in on them. Sour grapes or not, such extreme irresponsibility comprises a common perception of road rallies, and not just among schoolmarmish, culture-war types. Of course, rally organizers strictly forbid law breaking, which may squelch their liability but surely doesn't prevent the inevitable triple-digit interstate run. I'm still not over that perception, entirely, though Alex introduced me to a more sober group of rallyists than I'd known existed. These guys treat rallies the way Delta Force handles a special op. They seek to reduce risk in all of its forms, collect reams of reconnaissance data, select the latest high-tech gadgetry, and choose vehicles based on function over conspicuity. For instance, many recognize a sweet spot in the speed/fuel-economy curve that can make cruising at 90 more beneficial than bombing along at 130. They've also logged enough track hours to be safer than the uninitiated at high speed and seldom engage in risky moves — shoulder passing, for example. Simply, their aim is to win, not emerge after seven days with a force-multiplied hangover and an angry protozoa in their shorts. It's from this mode of thinking that Alex planned his coast-to-coast run - a multi-year effort that cost upward of $150,000. He chose Maher, a banker with extensive track experience and zero sense of humor (self-described), after a search to replace childhood friend Jon Goodrich, who bowed out as co-pilot after two failed attempts (how much can a friend be expected to endure?). Roy oversaw the effort with a manic efficiency, supervising a team that included J.F. Musial, an ex-employee of the New Jersey department of transportation, and another childhood friend, Paul Weismann, who piloted the spotter plane (yes they had a spotter plane, a Cessna). An exhaustive information-collection effort yielded hundreds of speed-trap locations and local police-radio frequencies, all managed by on-board GPS navigation, in triple redundancy. A cover story was derived; they were storm chasers following a major atmospheric disturbance. When time came to get underway, the sweating of details had expanded to include what manner of sustenance to carry on board (Red Bull, beef jerky, cigarettes).